During the last Baker’s Topic you were shown how to form a cob. Now we are going to take it a step further by showing how you you rub the piece forwards up the table to make it properly tight as a finished shape should be. 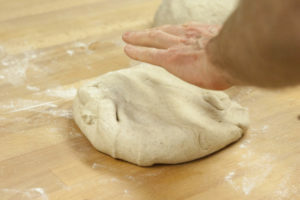 See the tension being placed on the piece as it is rubbed forward, the puffy part of the hand where the thumb meets the palm is doing the work. 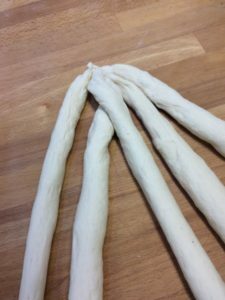 Pay careful attention to: making sure you keep to the very bottom the gathered clump of ragged edges that have been turned inwards by the cob shaping; avoid hooking your hand around at the end of the stroke – your hand must thrust forwards only. There must be no dusting flour on the bench, otherwise you skid in the dust, achieving nothing. Without dust, the bottom of the piece slightly sticks to the bench, increasing the needed tension. The forward rubbing features a steep hand, with the hand on edge, open palm, a vertical line from little finger to thumb. You push forward as well as pulling downwards on the piece as it is stroked forward. (The other hand is held aside, doing nothing at this point, indeed superfluous). As it thrusts forward, the hand goes slightly past the piece. 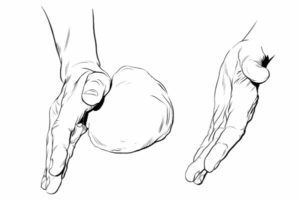 When the piece has been thrust so far forward that you are a little awkward and off balance, and you run the risk of pushing it off its axis so that the rough patch is no longer at the bottom, you must stop the forward stroking. Now you have all the tricks to give any cob a final tightening. This Baker’s Topic is in two parts really. The first part given here is about making a cob, or round shape. 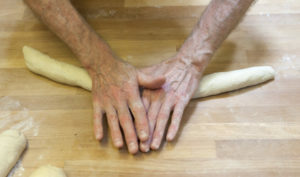 Professional bakers teach themselves to have one piece in each hand so that the time taken to complete the task at least produces two, not just one. 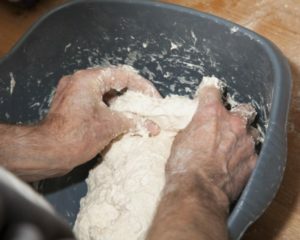 In this pic the action has just started and soon the hands will pump the dough around, each revolving in a different direction. 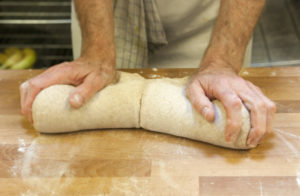 Rolling dough pieces into a loose ball to set them aside to rest (“intermediate proof”) requires a less thorough approach when compared with the tightness of the rolling that is required by a finished cob loaf. 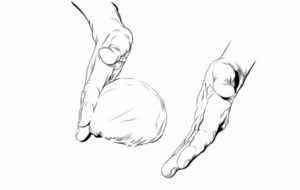 The instruction given now is a series of hand movements that amount to a slow and meticulous deconstruction of the terse and rapid action of the two-handed pro. PANARY students attending a conventional yeast course where the cob is on the programme will be familiar with it, and will have learnt the chant of the repeated “12 to 6, quarter-turn”. 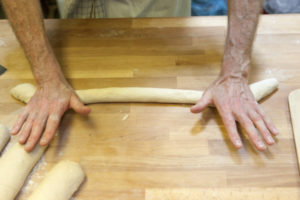 Making a tight cob belongs to the world of conventional yeast baking, where gluten is strong and shapes are finished tight. Not so suited to the world of sourdough baking when expulsion of gas is less desirable. Hey presto you have achieved a neat cob! Next newsletter – the action of rubbing the cob up the table so that it is superbly tight. Last time (Newsletter 35) we began the series by introducing the important skill of making a tight cylinder. Now you are going to take the cylinder to another stage – rolling it lengthways, to form a stick. Now you are ready to start rolling out that cylinder. 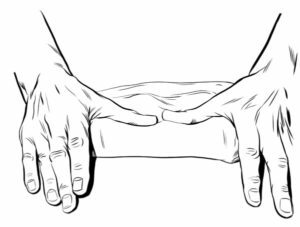 This is the default setting shown below, the position that the hands return to after they have completed a rolling action and must be returned to the middle – one is placed on top of the other. To finish, below is an image of rolling backwards. Good luck with stick making, fairly tricky when you are starting out to learn it. Notice that I say “stick” not baguette. For real baguettes you must have French flour, employ a French fermentation method, and some would say you even have to use French water! 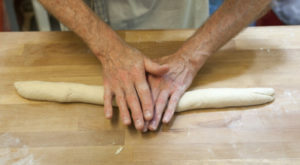 By the expression “table skills” the old craftsman bakers who taught me to bake in the 1970’s were referring to all manner of hand skills to do with dough handling. 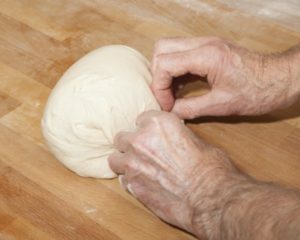 I shall do a series on this, and today we shall begin by looking at the simple task of rolling up a piece of dough towards you. Below is the photo that was placed at the top of this newsletter, where you see the final roll-up of a tinned loaf. It is tight and neat. 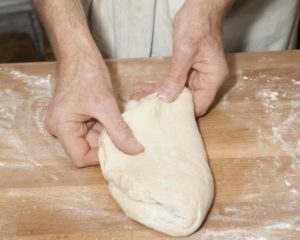 Firm pressure is put on the dough, but hand pressure should never be so tight as to tear the dough. Remember – torn gluten strands cannot mend themselves, so tears remain as blemishes. You see that the flattened dough piece has had each side folded inwards, one side placed on the other (like a pastry fold, in thirds). 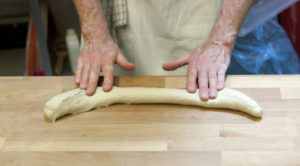 Now the baker proceeds to roll it up firmly creating a cylinder with a straight seam. 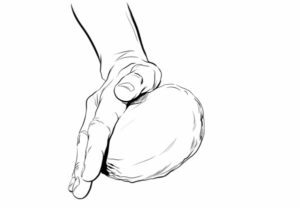 The main action is done by the forward thrust of the flat thumbs, which keeps it tight and neat. 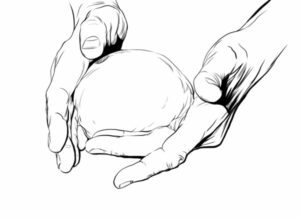 Thumb pressure is released, and a little roll towards you follows, done with the gathered fingers behind the loaf that can lightly draw its bulk towards you. Then resume pressure from the flat thumbs and another little increment of the task is performed. It is a jerky action, as thumb push is followed by finger roll. When I roll up a loaf like this, there will be four or five of these jerky motions. Next, moving away from moulding a shape for a tin, look at the formation of the cylinder that proceeds the making of a baguette. 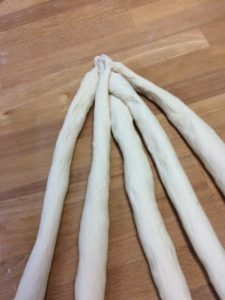 Then proceed to make a gently formed cylinder (see next pic) which will enjoy a short rest before being rolled into the long baguette by an entirely different action (which can be covered in a newsletter of the future). This photo (above) shows the action from the opposite side. 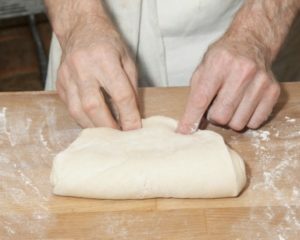 Making a cylinder is also a valuable skill for kneading inside a tub, or systematically working oil and water into dough (focaccia, olive bread, etc.) See below for inside the tub. 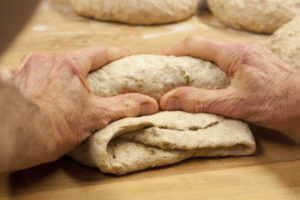 The same roll-up action is used when you want to make a large sprawling heap of dough into a neat and compact bulk for putting it in a container or simply moving it to another place. Well Panarians, there will be more of these table hand skills sessions. After all, instruction on “making a cylinder” was only Part 1. 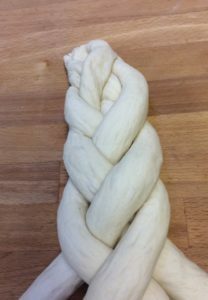 We are continuing the theme of last newsletter, plaiting. This time there is no clever starting in the middle liked you learned about the 3-strand plait. 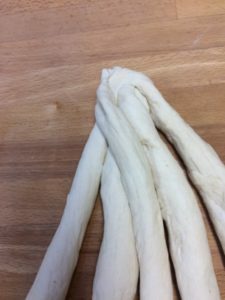 Remember to plait loosely, to allow it to hold its shape while it grows and eventually springs in the oven. First picture (above) shows the strands laid out in front of you, and 2 over 3. Second pic shows 5 coming back the other way, placed over 2 (sitting now between the new 1 & 3). Third pic shows the final move, 1 over 3,( now 1 is the new 3) and you start the three moves again…..
Good luck with plaiting – practice makes perfect after all.